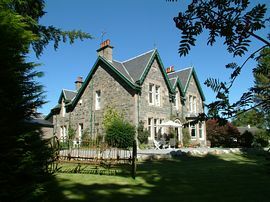 Greystones Bed and Breakfast Kingussie, has the Cairngorm and Monadhliath mountains on its doorstep; you can't help but enjoy the home comforts of Greystones. You will have a peaceful night in your single, double or family room, followed by days spent at your own pace. 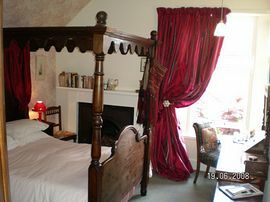 Have a delicious meal in one of the local restaurants and later relax by the open fire, in your private sitting room. You are secluded, yet within minutes of a huge variety of sights and places to see; this is the heart of the Scottish Highlands - a landscape that is amazing at any time of year. No wonder 'Monarch of the Glen' filmed here! We have restored the building with a subtle mix of period character, warmth, comfort and modern facilities. If you explore the peaceful gardens that surround the house, you may see some wildlife including Red Squirrels, Roe Deer and the occasional Buzzard. From here, lush woodland and the Cairngorm and Monadhliath mountains surround you. You can enjoy a delicious home cooked breakfast in our dining room. There is also a computer and Internet WiFi access for your use. In the Sitting room snuggle up to the open fire, make yourself tea or coffee and relax with the TV, DVD, Stereo, board games and library of books. Kingussie offers a wealth of activities and attractions for visitors. Sport fans will enjoy the famous Kingussie Shinty Club and the picturesque Kingussie Golf Club. The area offers a huge range of outdoor activities for all levels of ability, including walking, climbing, water-sports, gliding, golf, winter sports, fishing, cycling, riding and bird watching. Local places to visit include The Highland Folk Museum, the Highland Wildlife Park, Landmark (Kids will love it! ), Ruthven Barracks, Waltzing Waters, Aviemore Steam Railway, Dalwhinnie Whisky Distillery and much more. The hit BBC TV series 'Monarch of the Glen' used Greystones as a location for episode 2 of their 5th series. 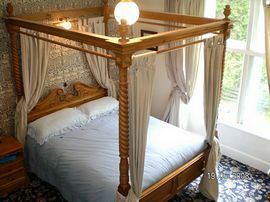 Eagle four poster double bed room. Pet Facilities: Pets are allowed. Pets welcome under supervision. Smoking Facilities: Smoking is not allowed. Sheltered outside. Turn up Ardbroilach Road and take the 4th right turn into Acres Road. Greystones B and B is at the end on the right. 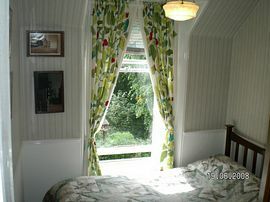 Single night B and B per person: £30.00 - £37.50 all year. 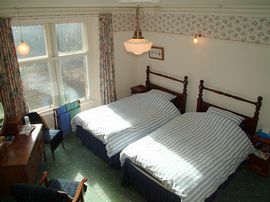 Private group per night (the whole house): Price on application. Nineteen years of very favourable comments; see our website for most up to date. 18 years with only compiments!